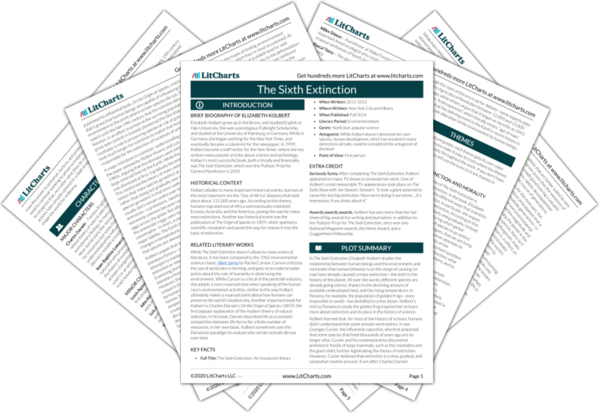 Instant downloads of all 945 LitChart PDFs (including The Sixth Extinction). LitCharts assigns a color and icon to each theme in The Sixth Extinction, which you can use to track the themes throughout the work. At the southernmost tip of the Great Barrier Reef in Australia, there’s a place called One Tree Island (which actually has many trees). On the island, there’s a small research station affiliated with the University of Sydney. In the station, teams of scientists from around the world study the chemical composition of the nearby coral reefs. Continuing the themes of the previous chapter, the research facilities at One Tree Island measure the changing biodiversity of the oceans; as we’ll see, scientists have determined that biodiversity is falling at an alarming rate. Coral reefs are enormously complex structures: they’re composed of minerals, but also plants and animals. Furthermore, coral reefs can grow over time, meaning that Darwin was wrong to think that they were “fixed” geological structures that had become submerged over time. Kolbert contrasts the elegance and inclusiveness of the coral reefs with the destruction and ground-clearing inherent to the building of a human city. In doing so, Kolbert reinforces one of the book’s most important themes: for most of human history, civilization has flourished at the “price” of environmental destruction. The impending destruction of the Great Barrier Reef reconfirms the antagonistic relationship between civilization and the environment. During her time on One Tree Island, Kolbert meets a scientist named Ken Caldeira. Caldeira’s research focuses on the impact of carbon dioxide on ocean pH (i.e., acidity), but he has also studied the chemical composition of forests and the recent changes in global temperature. Caldeira takes Kolbert on a diving expedition to photograph octopi, and Kolbert feels some of the same mystification that Cook must have felt when he first saw the Great Barrier Reef more than two centuries years ago. The Great Barrier Reef continues to convey a sense of wonder and awe to visitors. By writing about her own experiences at the reef, Kolbert adds a poignant note to her analysis of growing acidification. Climate change won’t just wipe out entire species; it will also destroy one of the most beautiful places on the face of the planet. The first evidence that carbon dioxide could destroy coral reefs came in the late 1980s with the Biosphere Project in Arizona, which was a huge, glass structure designed to be a self-sustaining ecosystem. While the earliest version of Biosphere was a failure—the people who tried to live there got altitude sickness because the carbon dioxide levels were too high—it yielded some interesting conclusions. The high carbon dioxide levels eroded the composition of coral inside the Biosphere, challenging the then-common notion that coral reefs are immune to changes in carbon dioxide levels. In recent years, scientific studies have shown that coral reefs erode significantly when carbon dioxide levels rise in the surrounding water, meaning that, at the current rate of carbon dioxide emission, reefs are expected to “dissolve” in the next half-century. It’s remarkable that scientists didn’t even know that carbon dioxide could interfere with the growth of coral reefs until the late 1980s. The study of climate change is so recent that many of the ideas that Kolbert discusses aren’t yet common knowledge. For many hundreds of years, scientists worked with the paradigm that humans could do whatever they want without permanently changing their planet’s environment. Now, it’s becoming clear that the opposite is true: human actions have tremendous (and possibly irreversible) consequences for the planet. That the effects of these environmental changes are so poorly understood adds to the sense of potential calamity. The passage reinforces some of the beauty and complexity of the Great Barrier Reef. At the same time, Kolbert notes that science hasn’t yet been able to solve some of the mysteries of the reef, reminding us that the study of climate change is still very recent—there are still many questions that need answers, and the consequences of our actions cannot be fully known. Coral reefs have come and gone throughout the planet’s history—in the Triassic Era, for example, nearly all the world’s reefs dissolved. It’s likely that coral reefs will disappear faster than they’ve disappeared at any point in the past, since they face the combined threats of carbon dioxide emissions, overfishing, and pollution. The rising temperature of ocean water also poses a significant threat to coral reefs. Warm water threatens coral reefs by increasing the amount of algae and plankton in the ecosystem, which in turn decreases the food available for larger coral species. The disintegration of coral reefs isn’t unprecedented in planetary history, and rising water temperatures won’t destroy all life in the oceans; indeed, it will cause some algae species to thrive. Nevertheless, the destruction of the coral reefs due to human activity is a process that Kolbert presents as tragic. The reefs are beautiful and complex and they stand, symbolically, for the earth as a whole. During her final days on One Tree Island, which coincides with “mating season” in the natural world, Kolbert observes the mating of the birds. As she explores the coastal area, she looks up at the stars and feels a profound sense of her own smallness and insignificance. Later, she notes the irony of her feeling—even though she’d come to One Tree Island to write about the enormous influence of human beings on the environment, she herself felt utterly insignificant when contemplating the environment. Although Kolbert is writing a book on science, she also includes moments like this one, in which she conveys a more abstract, even spiritual message. Perhaps the passage is meant to suggest the ultimate insignificance of human culture relative to the total history of the planet. Kolbert also conveys the beauty and majesty of the natural world, a world that’s now falling apart, thanks to human behavior. Once per year, the corals of the Great Barrier Reef participate in a “mass spawning,” an event during which corals reproduce asexually, creating millions of tiny egg-sperm bundles. One of the most common kinds of coral in the reef, Acropora millepora, produces “bundles” containing many dozens of eggs and thousands of sperm. Scientists have studied samples of Acropora millepora in order to test the impact of acidification on coral. So far, their findings have been discouraging—acidification can wipe out coral egg-sperm bundles. Late at night, however, Kolbert witnesses the spawning of coral in the Great Barrier Reef—from a human perspective, the corals seem to release a sudden stream of vivid pink bubbles. Kolbert ends the chapter on a note of wonder. The sight of “coral spawning” is both beautiful and poignant, since, based on the evidence Kolbert offers throughout the chapter, it’s possible that there won’t be many more years of coral spawning in the future. Like the eggs of the ammonites millions of years ago, sperm/egg bundles probably won’t be able to withstand the increasing acidification of the waters. Arn, Jackson. "The Sixth Extinction Chapter 7: Dropping Acid." LitCharts. LitCharts LLC, 22 Jun 2017. Web. 22 Apr 2019. Arn, Jackson. "The Sixth Extinction Chapter 7: Dropping Acid." LitCharts LLC, June 22, 2017. 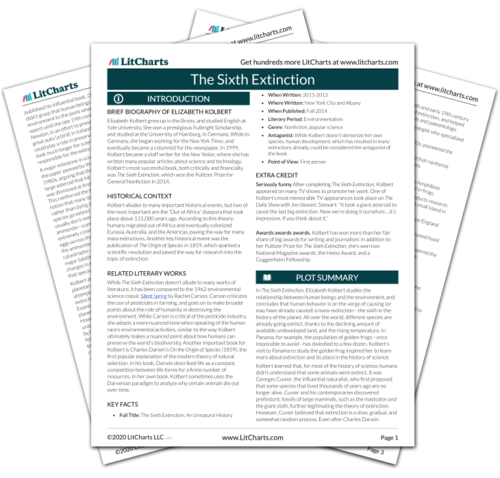 Retrieved April 22, 2019. https://www.litcharts.com/lit/the-sixth-extinction/chapter-7-dropping-acid.